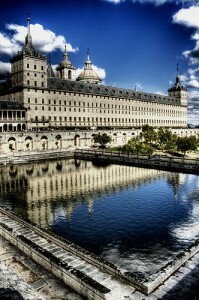 The Escorial is a vast building complex located in San Lorenzo de El Escorial, near Madrid, in central Spain. The building is the most important architectural monument of the Spanish Renaissance. Construction of El Escorial began in 1563 and ended in 1584. The project was conceived by King Philip II, who wanted a building to serve the multiple purposes of a burial place for his father, Holy Roman emperor Charles V; a Hieronymite monastery; and a palace. The first architect, Juan Bautista de Toledo, designed the ground plan on a gridiron scheme, recalling the grill on which San Lorenzo, the patron of the building, was martyred. After Toledo’s death, Juan de Herrera took up work on the project. Although Herrera was influenced by the styles of Sebastiano Serlio and Giacomo Barozzi da Vignola, the final product was uniquely Spanish. The building complex, severe in its lines, has four principal stories with large towers at each corner. Pellegrino Tibaldi and Federico Zuccaro were among the earliest painters to execute frescoes there. Other masters who painted works for the Escorial were El Greco, Luca Giordano, and Claudio Coello. An important collection of paintings by Renaissance and baroque artists donated by the crown is among the many artistic treasures housed in the complex. 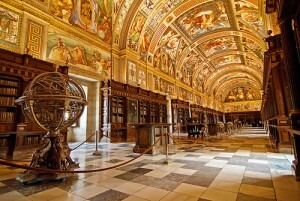 The decoration of El Escorial was carefully coordinated with the architecture to create a unified artistic effect. The sober statue of San Lorenzo on the main façade and the six statues of Old Testament kings on the façade of the basilica prepare the way for a splendid display of saints and kings inside the basilica. Philip was difficult to please, but there was a compelling aesthetic reason to restrict individual artistic expression at the Escorial. Decoration needed to be in keeping with the sober, unornamented classicism of the building if it was to bring the triumphant unity of the project to full expression. Although a great lover of painting, Philip made his choices for the painted decoration of the Escorial in relation to the architecture and the sculpture, trying to commission as few artists as possible in order to preserve a homogeneous effect. This ideal and its successful achievement are most visible in the sanctuary of the basilica. Nowhere else in Renaissance art do architecture, painting, and sculpture come together in a composition of such unified splendor in which every detail appears as a necessary part of the whole. 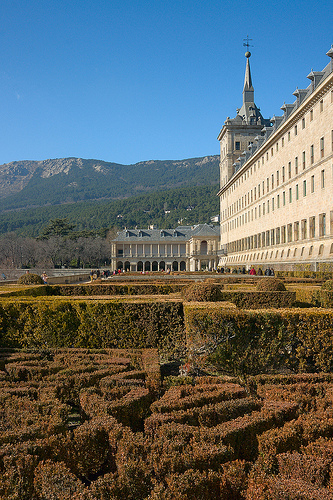 Later rulers modified El Escorial, although it still keeps its unity to this day. Philip IV completed the Royal Pantheon, a chapel containing the bodies of Spanish kings, in the 17th century. There have been some losses to its collections because of fire and pillage, but El Escorial remains the most complete and impressive monument of the later Renaissance in Spain. Today, the Escorial is a UNESCO World Heritage Site and it is one of Spain’s most visited landmarks.